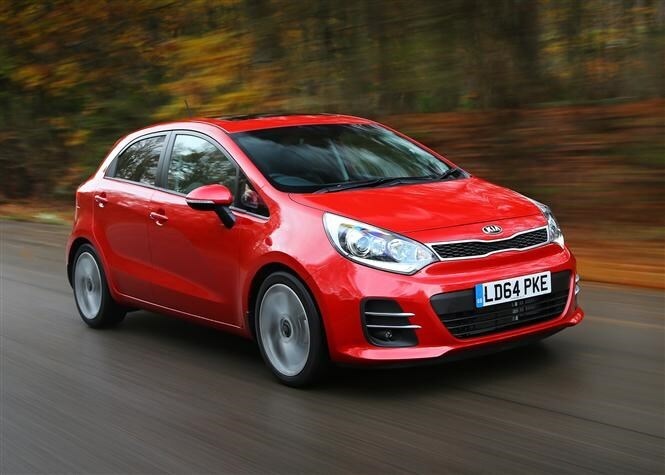 The Kia Rio has upped its game in 2015 with sharper styling and more equipment to tempt buyers away from the Ford Fiesta, Peugeot 208 and Renault Clio. Revealed at the Paris Motor Show in autumn 2014, the new Rio has been given sportier looking bumpers and more quality materials in the cabin. Also available for the first time are new items including touchscreen sat-nav, electrically adjusted and heated door mirrors, DAB digital radio, tyre pressure monitoring and a luggage net and undertray. Drivers can choose 19 combinations of the new Rio’s three and five-door body styles, five trim grades (1, 1 Air, 2, 3 and 4) and four original engines. 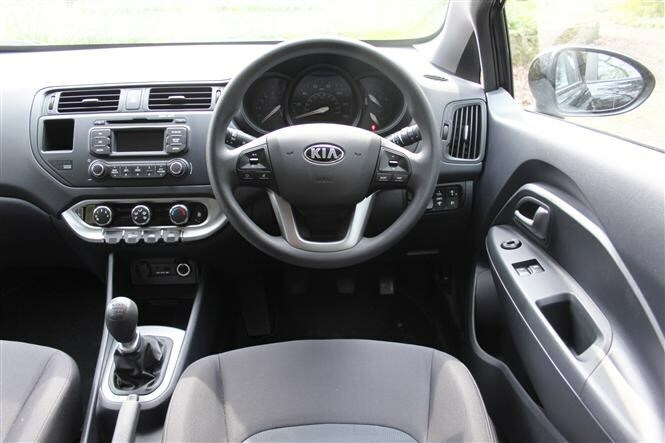 The Rio was a good looking car and Kia has retained much of its styling in this facelifted version. At the front of the new Rio, the lower front air intake has been redesigned and the fog light housings have been revamped with the addition of two chrome bars. Kia has carried this horizontal striping onto the rear bumper, incorporating restyled reflectors, which gives the back of the car a wider, more muscular look. The Urban Blue paint option replaces Electric Blue, and new 16- and 17-inch alloy wheels are available. The plain interior of the old Rio – especially so on lower spec models – has been lifted with high-gloss black embellishments on the centre console and a chrome handbrake button. New black cloth upholstery has been introduced to grades 1 and 1 Air, while grades 2 and 3 benefit from premium black cloth. If you want leather then grade 4 is the only way to get it. 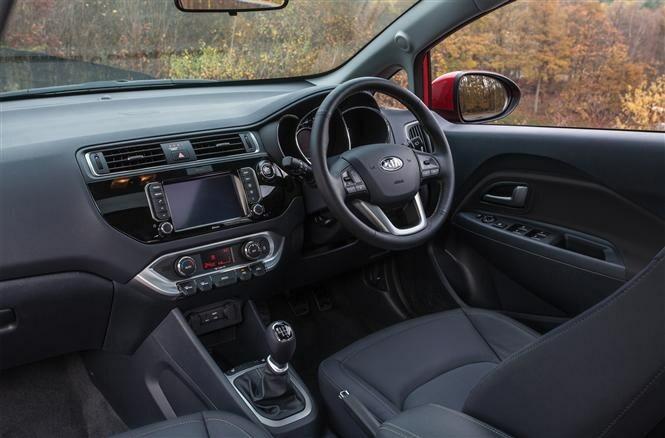 Headlining the new gadgets in the 2015 Kia Rio is a seven-inch touchscreen sat nav, available as standard in grades 3 and 4. The new unit comes with European mapping, traffic channel, and a reversing camera. However, if you want sat nav you will have to do away with a CD player, as Kia claims an increasing number of drivers are using smart phones and MP3 players instead of CDs. A DAB digital radio is now standard on all versions of the Rio, as is tyre pressure monitoring. The two entry level models now have electrically adjustable and heated door mirrors, while the more expensive specifications gain LED indicators and the ability to fold electrically. A luggage net and undertray has been added to grades 3 and 4. There is no change to the Rio’s four engine set-up, which means the 1.1-litre CRDi diesel, with its claimed fuel economy and CO2 emissions of 88.3mpg and 86g/km remains, as do the 1.25-litre and 1.4-litre petrol engines and a 1.4-litre CRDi diesel. All Rio models have the same safety package, which includes electronic stability control, anti-lock brakes with electronic brake force distribution and emergency brake assist, and twin front, side and curtain airbags. Prices start at £10,345 for a three door and £10,945 for a five door. 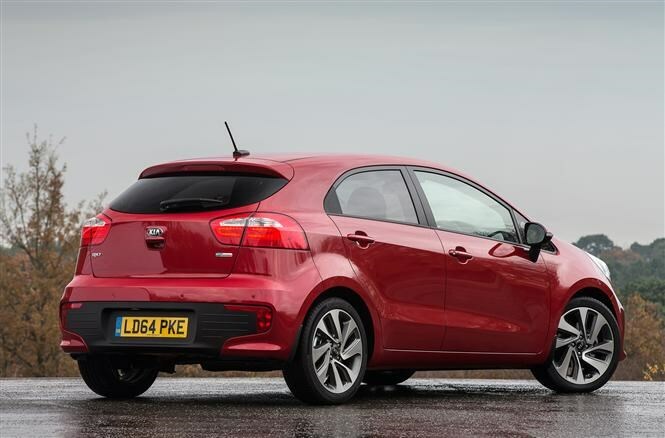 Click here for the full Kia Rio review.